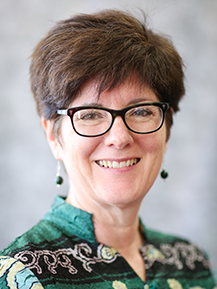 Dr. Hardy joined the Wabash faculty in 2006, having taught previously at Indiana University, St. Michael’s College, the University of Ljubljana (Slovenia), and the Slovenian Ministry of Defense School of Foreign Languages. Her professional interests include second language acquisition, language teaching methodology, and study abroad. Since 2008, she has accompanied Wabash students and faculty to Ecuador as part of the Wabash Summer Study Program that she co-directs with Dr. Dan Rogers. Her recent research is on the effects of extensive reading on second language proficiency. Dr. Hardy is a long-term co-chair of the Secondary Licensure (Teacher Education) Committee, and she is a strong proponent of off-campus studies. In her free moments, she enjoys spending time with her husband and their two sons. The four of them can occasionally be spotted around town walking their two dogs. "Student-Created Reading Materials in University Spanish Courses." Paper presented at the Third Extensive Reading World Congress, Dubai, United Arab Emirates, September 2015. "The Outcomes of a Mixed Level Extensive Reading Course in College Spanish." Paper presented at the annual conference of the American Council on the Teaching of Foreign Languages, November, 2014. “Extensive Reading in Spanish as a Foreign Language and its Effects on Language Proficiency, Reading Habits, Motivation, and Attitudes toward Reading.” Paper presented at the Second Extensive Reading World Congress, Seoul, Korea. September 2013. “The Ecuador study abroad program at Wabash College: Successes and Challenges of a cross-cultural experience.” Panel presentation (with Ivette Wilson) at the annual conference of the Latin American Studies Association, Washington, DC. May 2013. “Implementing Extensive Reading in the Spanish Language Classroom.” Session presented at the annual conference of the American Council on the Teaching of Foreign Languages. November 2012. “Extensive Reading in Spanish as a foreign language and its effect on reading ability, attitudes and motivation towards reading.” Paper presented at the annual conference of the American Association of Applied Linguistics, Boston, March 2012. “Professionalism in language teaching?” Plenary presented at the 2nd Congreso Internacional de la Escuela de Lenguas Modernas: Lenguas, Culturas e Identidades, University of Costa Rica, San José, December 2010. “Enseñanza de la literatura para una clase de español como segunda lengua.” I Jornada de Actualización de Docentes en la Enseñanza del Español como Segunda Lengua, Instituto Tecnológico de Costa Rica, Cartago, December 2010. “Student learning and the role of a pre-trip course in a short-term study abroad program.” Integrating Study Abroad into the Undergraduate Curriculum: Transforming On-Campus Teaching and Learning, Beloit College, Beloit, Wisconsin, November 2009. “An investigation of the benefits of a short-term study abroad program and the effectiveness of a pre-trip preparation course.” 6th Annual Conference of the International Society for the Scholarship of Teaching and Learning (ISSoTL), Bloomington, Indiana, October 2009. "The effects of a short-term extensive reading course in Spanish." Journal of Extensive Reading, 4(3), 2016. "Getting students to enjoy reading in a foreign language." The Language Educator, 8 (6), 2013. "Professionalism in language teaching?" Revista de Lenguas Modernas, 14, 2011. “Candidates in camouflage: Designing a proficiency test preparation course for the Slovenian Armed Forces.” In Snow, M.A. & Kamhi-Stein, L.D. (Eds. ), Designing a New Course for Adults (vol. 5 of TESOL Curriculum Development Series, K. Graves, series editor). Alexandria, Virginia: TESOL, 2006.